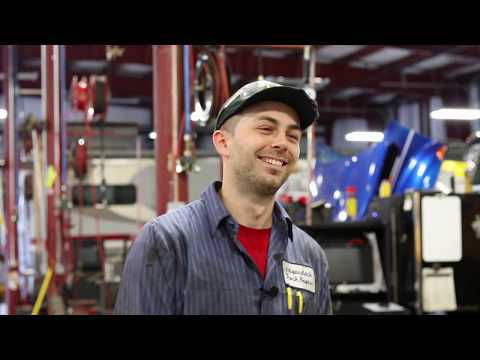 Fullbay is a software solution designed to support and manage the business of heavy duty, busy automobile (truck) repair shops and diesel repair shops. Cloud-based with centralized online access from any web-enabled device, the system promises to allow managers, techs and customers to engage with the operations within and outside the shop premises. From a custom branded portal, clients can administer their own information, submit repair requests, view maintenance histories, approve any work and indeed settle invoice payments. Those invoices can be raised accurately with every part accounted for, and both emailed to the customer and sent to QuickBooks Online within clicks. Customers and staff can also enjoy greater transparency on the work carried out on their units, with Fullbay designed to reflect an "electronic medical record" (EMR) for truck repair. Detailed service histories can be recorded, viewed and queried by components, system, specific parts or servicing dates. Real time statistical reporting features also provide metrics and insights into performance efficiency, while the online deployment allows Fullbay to connect and share its information with other associated cloud apps. Paperless, streamlined (the techs have to finish the job! ), knowing what has to be attended to on every job, and employee stats are up to date. It is easy to track what is going on with every piece of equipment, and billing does not get left behind - it is front and center to be attended to. We can log onto the software from anywhere - even when we're on vacation to check on things. The techs are learning to watch their own numbers and strive to improve. And most customers like the ability to access their own customer portal. It's been a win-win for everyone! AND NO MORE PAPER REPAIR ORDERS THAT GET DIRTY, GREASY, AND SMUDEGED! INVENTORY - I wish we could reconcile more than 1 page at a time. RECEIVING CUSTOMER PAYMENTS - I would like to see that submit button at the top! RETURNED PARTS - when keying multiple returns for a single vendor, they export to QuickBooks as multiple entries for a single credit memo - if keyed at one time in FullBay, would like to see it export to QuickBooks as one entry. Also have the ability to enter a Credit Memo date. The founders and their team are completely committed to providing the ''very'' best software to the heavy duty diesel truck,trailer,reefer repair shops. There isn't any other software on the market that can compete with the features and functionality of Fullbay. From the software layout, to the real time invoicing, real time stats on every job which include technician performance, the profitability on labor & parts, to the complete step by step visibility of jobs by everyone including the customer. This software is a game changer for those companies that are ready to take their business and customer experience to the next level. "The very best feature for me personally, is the ability to login anytime from just about anywhere and see own my company is performing!" We have had the system for 3 months and I can't wait to get rid of it. I feel like we are the only company who is actually using the system because of all the issues we have...if it was used by more companies they would have fixed all the issues already. Keep trying Fullbay.Invoicing is easier by letting you build the invoice during the job, as long as your tech can make a decent summary of the work performed. Contact Fullbay directly for pricing information. Fullbay is a diesel (truck) repair shop management solution that has been designed specifically to cater for heavy duty operations, offering centralized cloud-based access from any web-enabled device. A public-facing web portal allows customers to submit personally worded repair requests, while being able to manage units, make service requests, check maintenance histories, submit approvals and pay off outstanding invoices. Connectivity with QuickBooks Online sends raised invoices straight into the app while emailing a copy direct to the customer to speed up the payment process. Real time statistics provide up-to-date feedback on shop performance and tech efficiency, utilizing metric-based reporting to maximize service throughput. Fullbay promises to act like an "electronic medical record" for truck vehicles, promoting the logging and querying of full service histories that can be searched by service date, components, parts etc. Below are some frequently asked questions for Fullbay. Q. What type of pricing plans does Fullbay offer? Q. Who are the typical users of Fullbay? Q. What languages does Fullbay support? Q. Does Fullbay support mobile devices? Q. Does Fullbay offer an API? No, Fullbay does not have an API available. Q. What other apps does Fullbay integrate with? Q. What level of support does Fullbay offer?